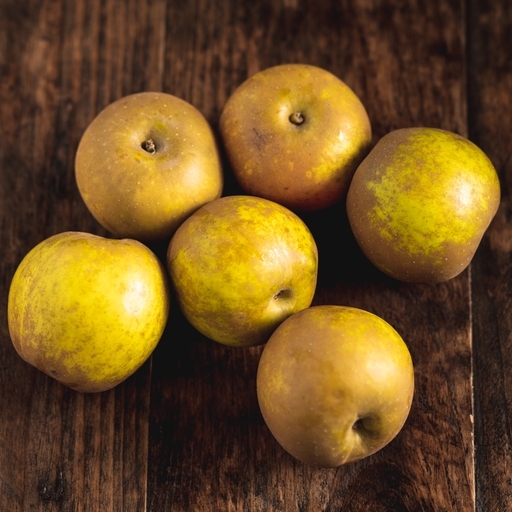 With their rough, tawny skin, russet apples might not be the prettiest to look at, but they are fantastic to eat. They have a distinctive flavour and scent unlike any other apple: fragrant, mellow, and subtly sweet. There is something almost nutty about them. Many russets can be a bit dry or floury, but these are a real triumph: exceptionally crisp and juicy, whilst keeping that distinctive russet flavour. Delivered fresh from the farm, so wash before eating. Keep at room temperature. Grown by Paul Ward on Mole End Farms, Kent. Paul has farmed organically ever since he bought his first orchard as a hobby in 1993. He believes in working with nature and leaving as gentle a footprint as possible.